Tetrachords are groups of four notes that make up half of a scale. 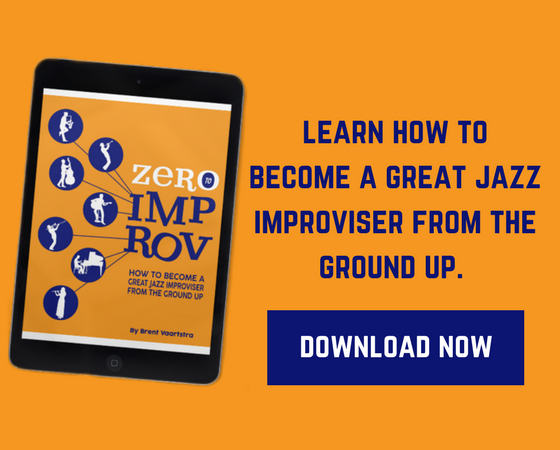 You can combine two tetrachords to form any of the common jazz scales (through you may need to add a doubled root for a 9-note scale like a diminished or bebop scale). 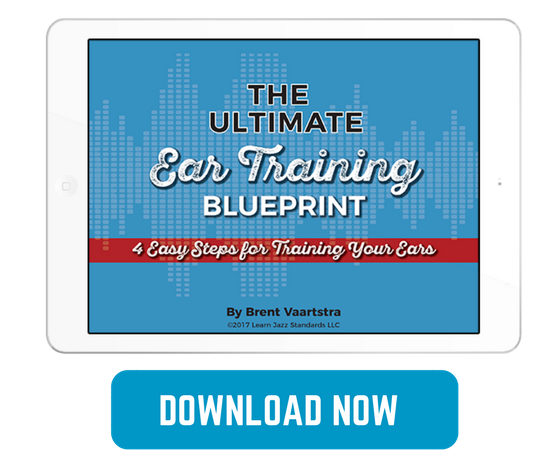 In Part 1, we learned about the different types of tetrachords. 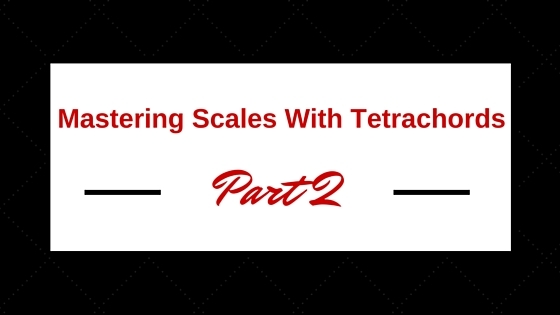 In part two, we will learn to combine these tetrachords into full scales! A tetrachord is a group of four pitches within the span of 6 half-steps (the interval of a tritone). Tetrachords make up a mini-scale. 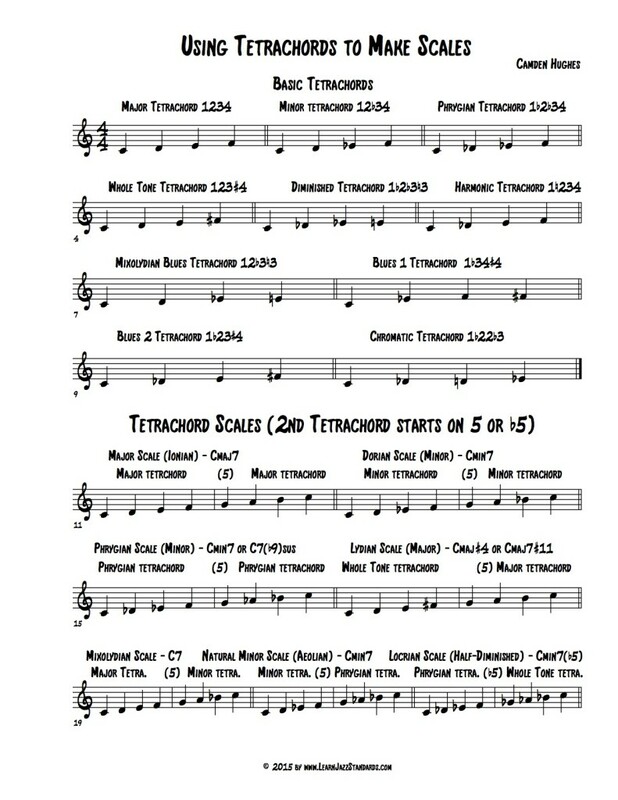 Tetrachords can actually be thought of as HALF of a scale. 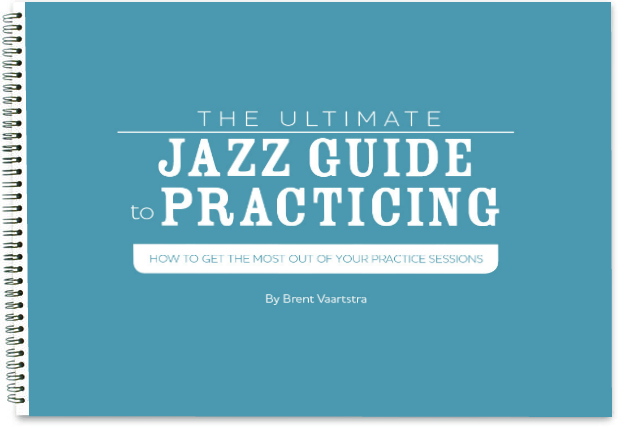 Most of the scales jazz musicians typically use are made up of two tetrachords. The Blues #1 Tetrachord is 1b34#4. The intervals are b3WH. The Blues #2 Tetrachord is 1b23#4. The intervals are Hb3W. 1. Major Scale-Major tetrachord, major tetrachord on 5th. 2. Dorian Scale-Minor tetrachord, minor tetrachord on 5th. 3. Phrygian Scale-Phrygian tetrachord, phrygian tetrachord on 5th. 4. Lydian Scale-Whole Tone tetrachord, Major tetrachord on 5th. 5. Mixolydian Scale-Major tetrachord, Minor tetrachord on 5th. 6. Natural Minor (Aeolian) Scale-Minor tetrachord, Phrygian tetrachord on 5th. 7. Locrian Scale-Phygian tetrachord, Whole Tone tetrachord on flat 5th. 8. Half-Whole Diminished (Dominant-Diminished) Scale-Diminished tetrachord, Diminished tetrachord on flat 5th, extra root at top. 9. Whole-Half Diminished (Diminished-Diminished) Scale-Minor tetrachord, Minor tetrachord on flat 5th, extra root at top. 10. Altered Scale (7th mode of Melodic Minor)-Diminished tetrachord, Whole Tone tetrachord on flat 5th. 11. Whole Tone Scale-Whole Tone tetrachord, Whole Tone tetrachord on flat 5th (2nd tetrachord starts on same note on which the first tetrachord ends). 12. Blues Scale-Blues 1 tetrachord, Blues 2 tetrachord on flat 5th (2nd tetrachord starts on same note on which the first tetrachord ends). 13. Lydian Dominant Scale (4th mode of Melodic Minor)-Whole Tone tetrachord, Minor tetrachord on 5th. 15. 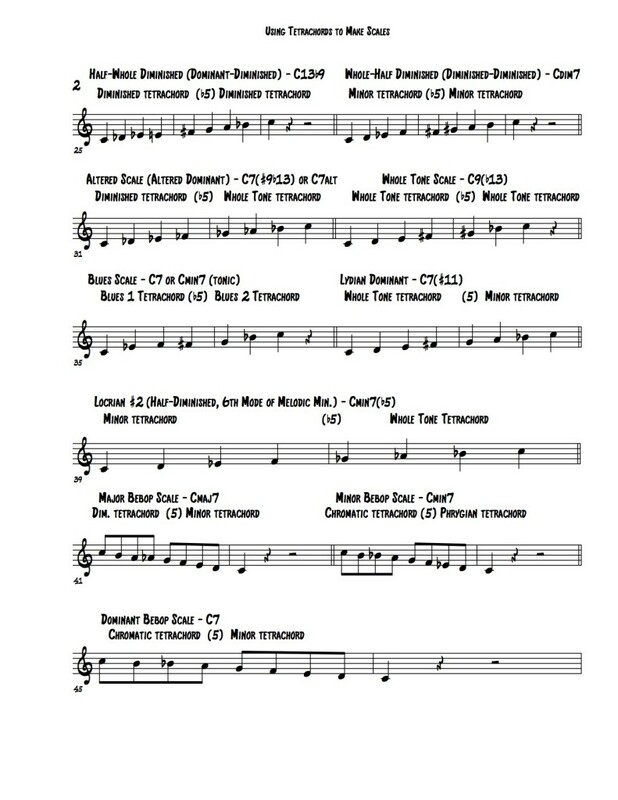 Major Bebop Scale (Descending)-Diminished tetrachord, Minor tetrachord on 5th, extra root. 16. Minor Bebop Scale (Descending)-Chromatic tetrachord, Phrygian tetrachord on 5th, extra root. 17. Dominant Bebop Scale (Descending)-Chromatic tetrachord, Minor tetrachord on 5th, extra root.